Pr e s by te r i a n s To d ay | OCTOBER/NOVEMBER 2017 45 CLASSIFIED ADS AD RATES: $12.50 per line (approx. 40 characters). DISPLAY AD: $137.50 per column inch. DEADLINE: 6 weeks before issue date. Email copy to today@pcusa.org, or call 800-728-7228, ext. 5772. Classifieds also appear on Presbyterians Today's website at no additional cost. A SMALL-TOWN CHURCH WITH A BIG TOWN MISSION! We seek God's choice for a dy- namic, warm, uplifting, and spiri- tually mature Pastor and Head of Staff, to guide our 700+ vibrant members to serve the Lord with our actions, faith and compassion. We have a 300- year history as inclusive and loving disciples of Jesus, doing for and giving to our diverse NYC-area subur- ban community and beyond. Our Church Family, with a staff of 12+ full- and part-time members, provides many programs for all ages. We feed and comfort the needy, educate the youth and worship through scripture, spirituality and music. All are welcome to join our faith journey, living out God's will as we implement strategies toward new possi- bilities for our community in transition. Applicants (5-7 years' experience as head of staff or compara- ble role) may submit your PIF through the PC(USA) CLC (MIF #04679.AF) or by contacting the PNC at pncfpcm270@gmail.com. First Presbyterian Church of Metuchen, 270 Woodbridge Ave., Metuchen, NJ 08840-2100. fpcweb.org. SOLO PASTOR Situated on the beautiful High Plains of Colorado, the First Presbyterian Church of Yuma is seeking a full-time solo pastor. We are a healthy, financially stable church in an average sized town in northeast Colorado, about two hours from Denver. We are a close-knit community with a backbone in agriculture and a tradition of taking care of each other. Come be a part of our team as we strive to transform lives, renew hope, provoke change, inspire compassion, and bind people to one another! You can find us on Facebook at First Presbyterian Church of Yuma, or go to onclc.pcusa.org (MIF #01195.AE1). Email contact: pncfpcyuma@gmail.com. S t a t e m e n t o f O w n e r s h i p , M a n a g e m e n t , and Circulation (Required by 39 U.S.C. 3685). Publication Title: Presbyterians Today. Publication no. : ISSN 0442-700. Filing date: 08/24/2017. Issue frequency: Bimonthly. No. of issues published annu- ally: 6. Annual subscription price: $24.95. Complete mailing address of known office of publication: 100 Witherspoon Street, Louisville, KY 40202-1396. Contact person: Jeffrey Lawrence. Telephone: 502-569-5093. Complete mailing address of head- quarters or general business office of publisher: Presbyterian Church (U.S.A.), 100 Witherspoon St., Louisville, KY 40202-1396. Full names and complete mailing addresses of publisher: Jeffrey Lawrence, 100 Witherspoon St., Louisville, KY 40202-1396; Editor: Susan Washburn, 100 Witherspoon St., Louisville, KY 40202-1396. Managing Editor: (Same as Publisher). Owner: Presbyterian Mission Agency, Presbyterian Church (U.S.A.), 100 Witherspoon St., Louisville, KY 40202-1396. Known bondholders, mortgagees, and other security holders owning or holding 1 percent or more of total amount of bonds, mortgages, or other securities: None. The purpose, function, and non-profit status of this organiza- tion and the exempt status for federal income tax purposes has not changed during the preceding 12 months. Issue date for circulation data below: August/September 2017. Extent and nature of circulation: Total no. copies (net press run): average no. each issue during preceding 12 months, 34,053; single issue nearest filing date, 16,983. Paid and/ or requested circulation: Paid/requested outside- county mail subscriptions, average, 16,572; single issue, 16,415; in-county, average, 0; single issue, 0; sales through dealers and carriers, street vendors, and counter sales, average, 8,070; single issue, 0; other classes mailed through the USPS, average, 0; single issue, 0. Total, average, 24,642; single issue, 16,415. Free distribution by mail: outside-county, average, 129; single issue, 127; in-county, average, 0; single issue, 0; other classes, 0, single issue, 0. Free distribution outside the mail: average, 553; single issue, 220. Total free distribution: average, 682; single issue, 347. Total distribution: average, 25,324; single issue, 16,762. Copies not distributed: office use, leftovers, average, 8,729; single issue, 221; Total: average, 34,053; single issue, 16,983. Percent paid and/or requested circulation: average, 97.31%; single issue, 97.93%. Paid electronic copies: average, 318; single issue, 296. Total paid print and electronic cop- ies: average, 24,960; single issue, 16,711. Total print distribution and paid electronic copies: average, 25,642; single issue, 17,058. Percent paid, both print and electronic copies: average, 97.34%; single issue, 97.97%. I certify that all information furnished above is true and complete: Jeffrey Lawrence, Publisher. 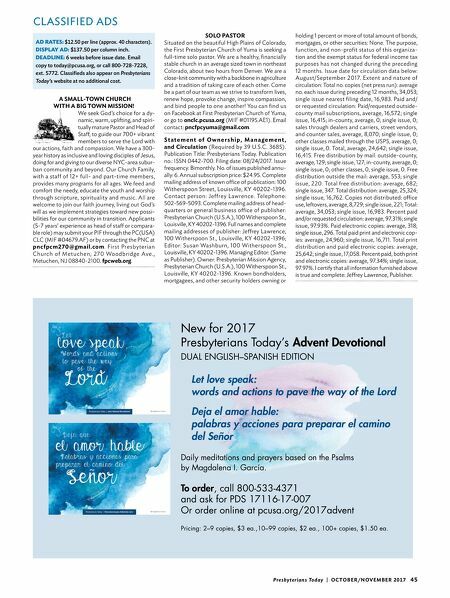 New for 2017 Presbyterians Today's Advent Devotional DUAL ENGLISH–SPANISH EDITION Let love speak: words and actions to pave the way of the Lord Deja el amor hable: palabras y acciones para preparar el camino del Señor Daily meditations and prayers based on the Psalms by Magdalena I. García. To order, call 800-533-4371 and ask for PDS 17116-17-007 Or order online at pcusa.org/2017advent Pricing: 2–9 copies, $3 ea.,10–99 copies, $2 ea., 100+ copies, $1.50 ea.